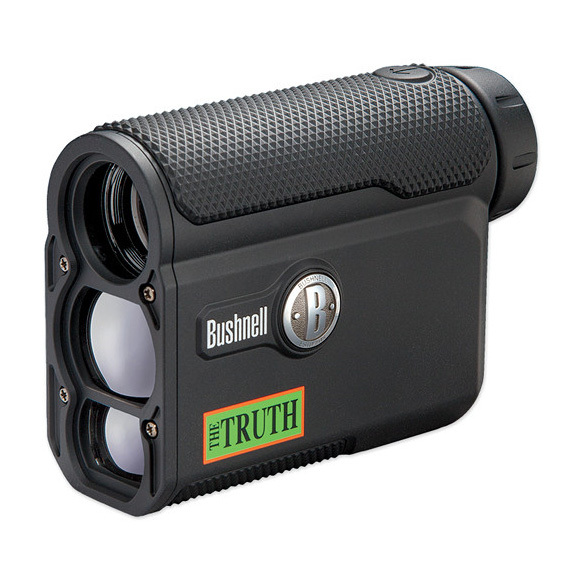 The The Truth 4x20 Laser Rangefinder from Bushnell combines a laser rangefinder and inclinometer inside a water-resistant housing to deliver precise distance measurements almost anywhere that adventure leads. Angle Range Compensation (ARC) technology makes this device handy for archers and riflemen alike. In addition to an 850-yard range and one-yard accuracy, The Truth rangefinder includes two targeting modes to best suit the target's surroundings. All measurements, mode indicators, and aiming reticle are displayed on the rangefinder's in-view LCD screen. This rangefinder combines readings from its laser emitter/receiver and inclinometer to determine the compensated range based on the relative angle of the shooter to their target. Using Bow mode, archers can find the horizontal distance to the target without having to factor-in the elevation difference between their position and the target. The Truth rangefinder has a textured rubber grip for non-slip handling and a water-sealed housing that enables the rangefinder to perform in light rain and humidity.